Product prices and availability are accurate as of 2019-04-23 02:23:02 UTC and are subject to change. Any price and availability information displayed on http://www.amazon.com/ at the time of purchase will apply to the purchase of this product. The Matrix Tactical Systems SDEU vest is designed for Airsoft by Airsoft players. It is light, comfortable, very useful, fully adjustable and slick looking! 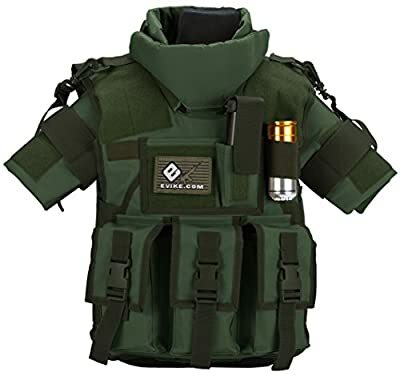 This is truly a great piece of armor that is lightweight, provides maximum protection, and doesn't get in the way of mobility. Because it is built for Airsofting, it is equipped with pouches for magazines, a grenade shell holder and even a hydration pouch. The detachable neck guard and shoulder pads provide even better protection versus other standard vests on the market. The Matrix SDEU vest is patch ready as there are velcro panels on the admin pouch and on the shoulder pads. These are perfect for flags, team patches and morale patches.